In honor of tonight’s book signing at Brazos Books, I have to share this funny thing from several months ago. Most of my kids have read my short story in the Road Kill 2 anthology. I love that my kids think what I do is pretty cool. It’s about the only thing I do that they think is cool, if I’m being honest. My 13yo wanted to take the book on a scout campout to read around the campfire to his friends. The 11yo kept swiping extra copies from my stash in my office. And the 9yo was delighted to finally get his hands on it when his older brothers were done. It was the 9yo who took it to an entirely awesome level. 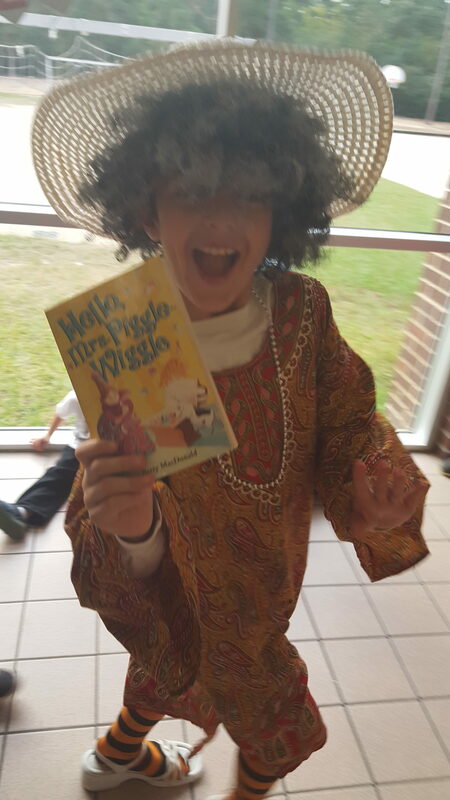 His elementary school has a character day where the kids pick a character from a book to dress up as. Then all of the classes march around the school in a parade for family members to enjoy. 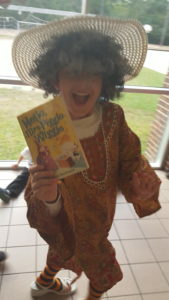 My son wanted to be Harriet from El Sacoman, but horror isn’t exactly considered children’s lit. I tried to explain this to him, but he was pretty insistent. He’s what you might call a high energy kid, which is really code for he’s-super-smart-and-loves-attention-and-doesn’t-have-a-subtle-bone-in-his-body and all those things combine to get him trouble. A lot. So I knew this book wasn’t going to just casually slide past the teacher. I talked him into taking a Mrs. Piggle Wiggle book as a backup. Just in case. As you can see from the picture, he’s not holding Road Kill 2. But here he is thrilled to be Harriet in secret. And as for my beloved Mrs. Piggle Wiggle from my childhood? I’ll never think of her quite the same.